One of the most powerful Android smartphones in India. Powerful performance; Brilliant screen; Good camera; Impressive sound output; Supports multiple video formats out of the box; Long battery life. 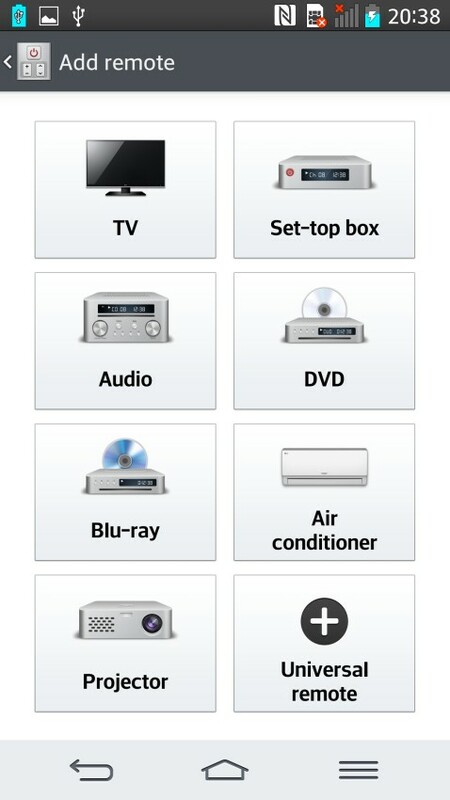 Run-of-the-mill design; Tacky UI; Uncomfortable for single-handed use; Lacks memory card slot. 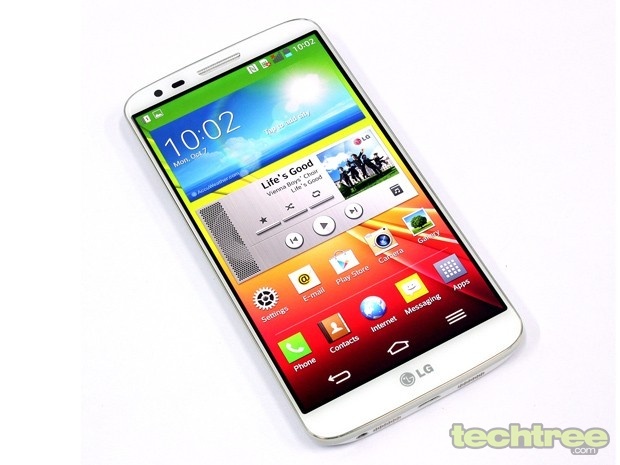 LG heats up the competition for the insanely powerful Android handsets with its G2. It's the company's first smartphone in recent years that doesn’t carry the Optimus moniker. The phone packs in a 5.2” full-HD IPS screen and 13 megapixel camera. There’s a Snapdragon 800 chipset at its heart. 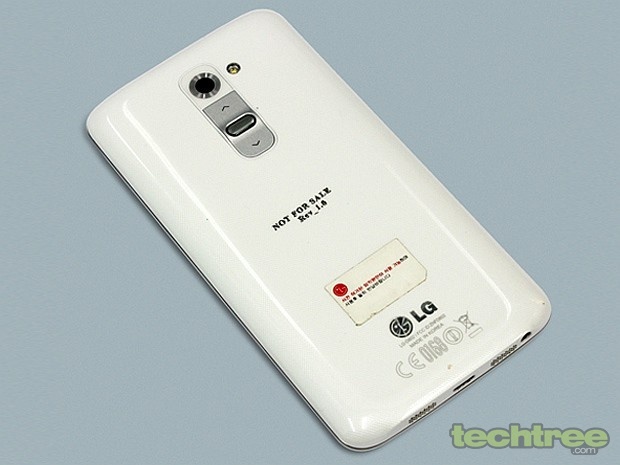 Another interesting aspect is the set of rear buttons, which LG is promoting as an innovation. So has LG outdone its South Korean compatriot? Let's find out. At a quick glance, the G2 looks like a smaller version of the G Pro. However, there are quite a few things that are different — the G2 lacks hardware buttons on the front. Although the build is quite solid, the phone still feels a touch plasticky. The phone sports a 5.2" screen, which is slightly bigger than that of the Samsung GALAXY S4. Due to its thin bezels, the G2 looks hardly any bigger than its Samsung counterpart. The thin bezels come with its own set of drawbacks, such as unintentional interaction with the touch screen. It's difficult to grip the phone without accidently clicking something on the screen. From its usability perspective, I'd have preferred slightly bigger bezels over the edge-to-edge screen; functionality over style. In G2, the conventional buttons have been replaced by a set of rear keys. To be precise, it features a lock/power button sandwiched between volume keys. According to the manufacturer, this new key placement is perfectly accessible to your index finger. Now that's true to some extent. 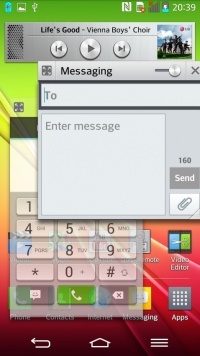 The buttons are easily accessible, however when you press the keys, the phone tends to pop-out of your hand. So while I appreciate that LG has thought out of the box, it doesn't really better the conventional setup significantly. The 5.2” IPS screen on this phone is quite brilliant at producing vibrant colours. This full-HD screen is impressively sharp. At 450 nits, it’s 50 nits brighter than the recently-reviewed Optimus G Pro. The screen is as good if not better than that of the iPhone 5. Thanks to a layer of Gorilla Glass 2, you don't have to worry about scratches. Much like high-end Nokia phones, the G2’s screen is slightly curved at the edges. The display’s sunlight legibility is also quite good. All in all, LG has done a great job in this department. The device is powered by a quad-core Snapdragon 800 chipset clocked at 2.2 GHz. There's 2 GB RAM to help your apps load faster. Apart from that you get 16 GB/32 GB internal storage, Wi-Fi, Bluetooth 4.0, A-GPS, 4G connectivity, and 3000 mAh battery. What’s missing here is the microSD card slot. Like most top-end Android handsets, the G2 features a 13 megapixel autofocus camera. LG claims that this smartphone offers superior low-light imaging with the help of OIS (Optical Image Stabilisation). We will verify that claim later in the review. Details specs can be found at the end of this article. 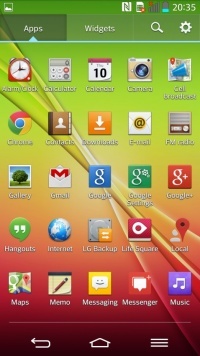 The G2 runs Android 4.2.2 (Jelly Bean) with LG's customised UI on top of it. Now, many may complain of not getting the latest version of the OS, but that doesn't matter to me, as long as the user-experience is good. And LG has delivered well on this front. Things such as swiping through homescreen and transition effects are quite smooth. However, nit-picky folks will be able to spot a slight stutter. What I personally didn’t like here is the way LG has customised the Android OS. 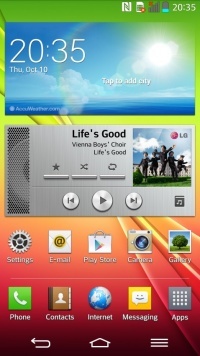 It’s every bit tacky as Samsung's TouchWiz. For starters, the unlock screen has an incredibly flashy sparkling effect, which reminds me of an annoying character from the teen-movie Twilight. The garishness doesn’t stop there. The colour scheme and icon design are also overly in-your-face for my liking. True, we can’t expect every manufacturer to come up with iOS and Windows Phone like elegant interface, but then why not at least keep things clean and simple? 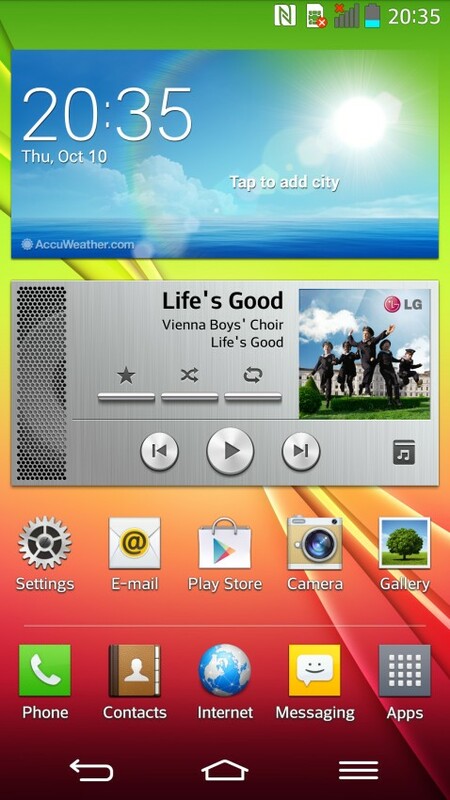 Take for example, HTC’s Sense 5 UI, which proved that even Android OS can look good when customised properly. To make sure that the G2 doesn’t lose out to S4 in terms of features, LG has thrown in a mix of useful and stupid functions. 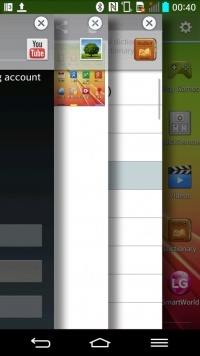 First up is Knock-On feature, that lets you unlock the G2 by simply tapping twice on its screen. It’s quite useful, especially considering LG’s unconventionally placed lock button. Then there’s Guest Mode, which comes with limited access. This is much like Microsoft's Kid's Corner. Using QSlide, you can run two or more apps in a windowed mode. It's very similar to Samsung's Pop-up window, but G2 offers more controls such as the ability to control window sizes and transparency. It’s a nice feature to show-off what your new phone can do, but not too useful. Slide Aside is another pointless feature. With a three fingers swipe gesture from right to left (which is quite awkward), you can minimise three apps one at a time, then switch between them by swiping in reverse (left to right, and again the use of three fingers in a must). Now, why on Earth would anyone want to perform this finger exercise just to switch between apps? 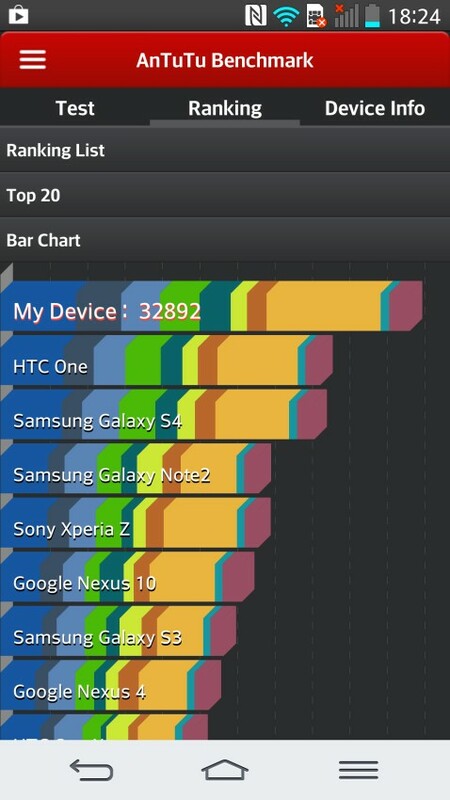 In AnTuTu benchmark, the G2 scored a staggering 32,892 points. To put things in perspective, the Samsung GALAXY S4 clocks in at 27650. 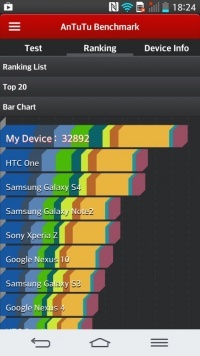 In Quadrant too, the G2 shines with a score of 20,272. 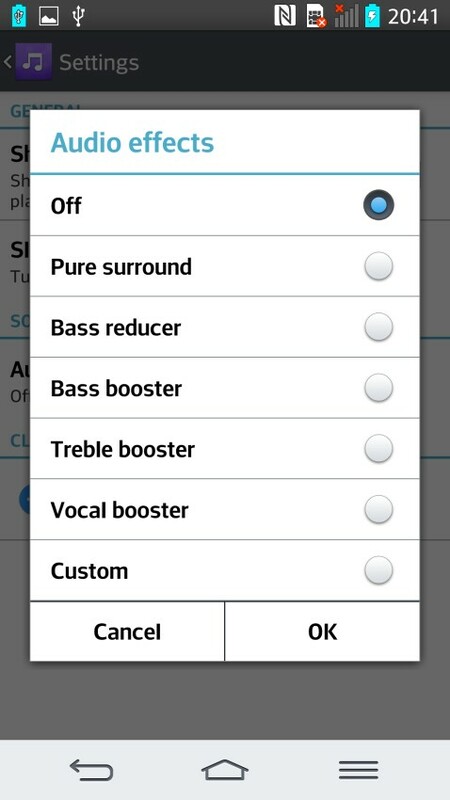 The music player’s interface is similar to that of Optimus G Pro. It’s straightforward, and easy to use. 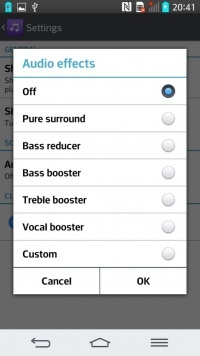 It offers usual set of equaliser settings and sound enhancements, including Dolby Digital. LG forgot to send us the bundled earphone, so we can’t comment on it. 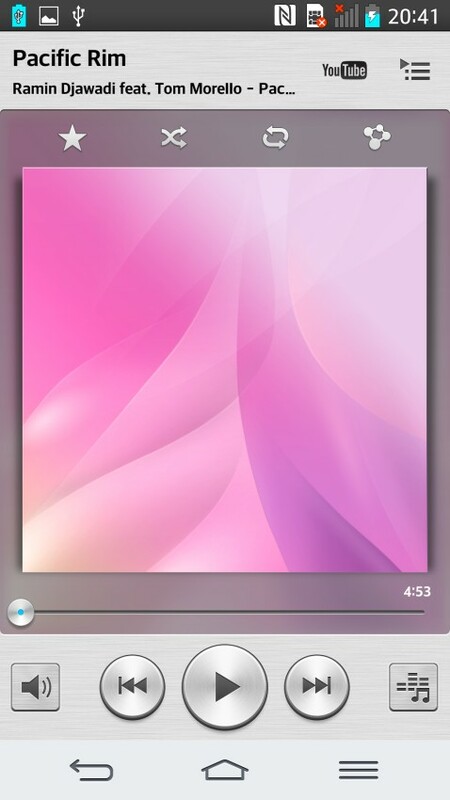 However, the device's sound quality is very good. Thanks to its fantastic 5.2-inch screen, watching videos is a treat on the G2. The phone supports most video formats including MP4, DivX, XviD, and MKV out of the box. It also offers a few interesting features, including the ability to control the playback speed from 0.5x to 2x, zooming in and out of a video, and an enhanced seek bar that displays a thumbnail of the frame at the target location. It even handles subtitles without the help of any third-party software. 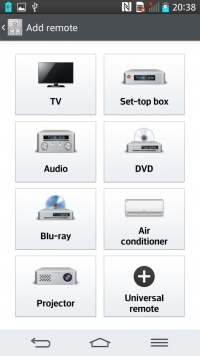 Not only can LG G2 be used to remotely control home entertainment devices, it can also learn from conventional remotes and be customised to operate multiple devices with flexible layouts and keys. Like most top-of-the-line Android phones, the G2 comes with a 13 megapixel camera. The lens is protected by a layer of scratch-resistant sapphire crystal glass. The camera offers 12 modes: Normal, HDR, Panorama, VR panorama, Burst shot, Beauty shot, Dual camera, Times catch shot, Intelligent auto, Sports, and Night. Most of these features are self-explanatory. In case you’re confused, Shot & Clear lets you remove photo bombs from your pictures. 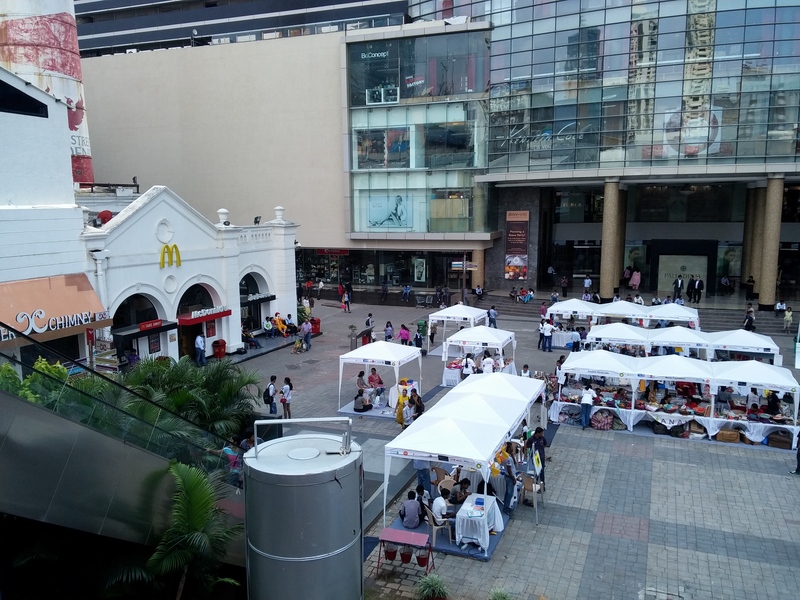 That’s exactly similar to the erase functionality found in Nokia’s Smart Shoot lens. The G2 can record full-HD videos at up to 60 fps. While frame-rate is great, we found that the continuous auto-focus sometimes goes haywire where there's a change in lighting. The phone offers strong network reception and impressive voice quality. Moving on to messaging, the on-screen keyboard is quite responsive. However, LG could have done better by removing unnecessary space between characters. The G2 packs in a 3000 mAh Li-Po battery. With normal usage, it easily keeps the phone powered for two days. In our 720p video loop test with brightness set to 60%, it lasted for over 11 hours. That's excellent for an Android phone with a large full-HD screen and a powerful quad-core CPU. 5.2" HD-IPS screen with 1080x1920 pixels. Corning Gorilla Glass 2 protection. 2.26 GHz quad-core CPU, Adreno 330 GPU, 2 GB RAM. Wi-Fi, 4G, Bluetooth 4.0, NFC, A-GPS, FM radio, Infrared port, Micro-USB 2.0 (with OTG support). 13 megapixel autofocus camera with LED flash.